Savvy investor Christine is on the look-out for low-risk opportunities to maximise returns. Don’t let the “housewife” label mislead you; Christine Ang, 44, is the very model of efficiency. A savvy investor in her own right, Christine began investing in her 20s when she was running her own business specialising in corporate gifts. Now in her mid-forties, she has a diversified portfolio consisting of multiple endowment plans, stocks, a fixed deposit account and insurance. What’s more, she manages her husband’s investment portfolio as well. Christine has a balanced approach to investing, as she avoids taking unnecessary risks and is always on the look-out for a low-risk opportunity to maximise the returns on her cash. She visited OCBC to find out more about OCBC Life Goals with this objective in mind. Christine’s immediate financial priorities are saving for her two children’s education, as well as her retirement. She has provided for both these goals via endowment plans as well as various deposit products, drawn by the attractive interest rates. While Christine has made a great start, the OCBC Life Goals approach was still well-suited for her as it caters to the uniqueness of each customer and their goals. A thorough financial needs analysis by Soon Song, an OCBC Personal Financial Consultant, indicated that Christine’s investments would allow her to comfortably retire according to the lifestyle she desires, with an excess of $135,000 at her retirement age of 62. The conversation took another turn as Soon Song created several “What If” scenarios, to ensure Christine was equipped to deal with unexpected events that could derail her plans. What if her potential allowance from her children is reduced from $4,000 to $1,000? Likewise, what if her property did not reap the expected rewards in terms of sale or rental? What if unplanned circumstances affected pay-outs from her endowment plans? The outcome was drastic as the shortfall to Christine’s retirement goal could be close to $900,000. The objective of the exercise was to ensure Christine sufficiently built her investments now, and not be filled with regret later. "Unforeseen circumstances should not stop you from retiring," says Soon Song. "The OCBC Life Goals approach can help identify potential pitfalls, so that customers plan or reduce the shortfall to better manage their retirement goals." 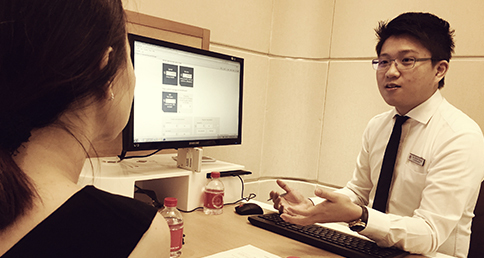 As Christine already had a diversified portfolio, Soon Song proceeded to recommend short-term fixed deposit products to complement her investment suite. Such products allow her the flexibility to grow her finances, as well as take advantage of opportunities as and when they arise. Soon Song also recommended the OCBC 360 Account - which earns higher interest - as a deposit account for both her and her husband, so that they could reap benefits of up to $1,950 per year. Christine is pleased with the recommendations and intends to come back next year for a review to make adjustments in her Life Goals as needed. "I appreciate that he took time to understand my situation and needs. It was refreshing that Soon Song was not pushing products that I had already invested in. As a seasoned investor, I realise that I might be somewhat cynical, having been burnt by unit trusts in the past. However, this session was helpful in prompting me to take a more active approach in growing my wealth, especially when it comes to regularly checking on how my investments are performing. Having an existing blended portfolio, I have no immediate need for funds but am looking to grow my finances more organically," Christine said. Look to move to a portfolio of unit trust for income which are passive investment (vs stocks investment). Income can be paid into your account to help fund your retirement lifestyle.